We start off with a short talk on some of the basic aspects of bee keeping; including the bees in the hive, the jobs they do and an introduction to the equipment used. 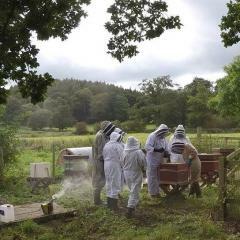 Bee suits and gloves will be provided, however, you will need to bring wellies (recommended) or sturdy shoes and thick socks you can tuck the bee suit into. The experience will run from 1:00pm to 4:00pm, please arrive ten minutes before the start time to allow for sign in and making a cuppa. Please note we can only open the hives in good weather. If rain is predicted is may be necessary to reschedule your session, we will give as much notice as possible in this situation. This experience is suited to those aged 12 and over, under 16s must be accompanied by a paying adult at a ratio of no more than 1:2.